Alexander Coward’s official employment with the University of California, Berkeley, ended in the summer of 2016. But students will still be able to find him on campus once a week, holding office hours at a cafe. Coward started teaching in Berkeley’s math department in 2013. A popular lecturer, he often eschewed traditional homework assignments and quizzes in favor of a more outcome-based, rather than grades-based, approach. Instead of trying to motivate students to learn with graded homework assignments and quizzes, he spent his classes trying to focus on intrinsic motivation, repeating his explanations multiple times and asking often if everyone understood. While that proved popular with students -- who would go on to perform at or above average in their future math courses, which Coward said validated his approach -- his grading system, which relied heavily on the final exam, and teaching style weren’t nearly as popular with his department . Memos and emails documented Coward’s departure from department norms, which was viewed unfavorably despite his popularity among students, and their academic success. In 2015, the university decided not to renew Coward’s lecturer contract, and despite a suit for unlawful termination -- which has now been settled -- he left the university last year. At least, he left in his official capacity. 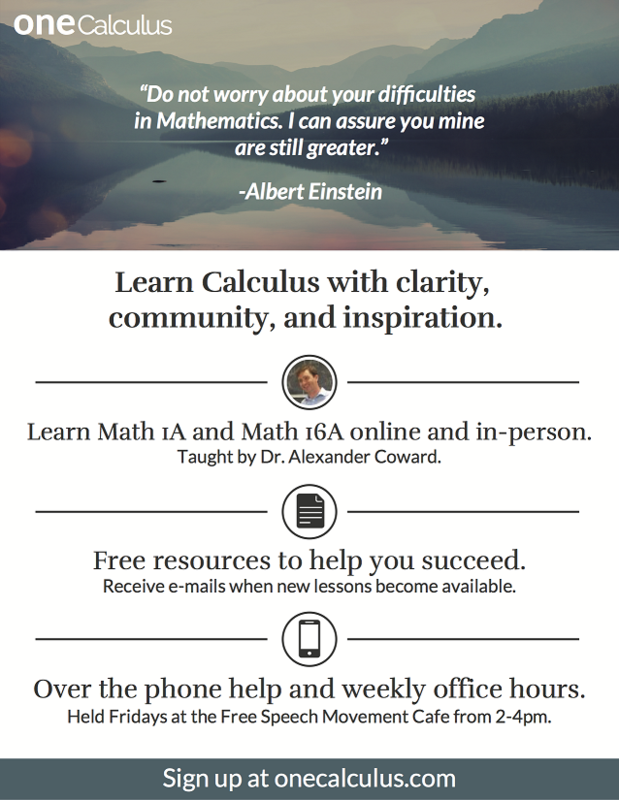 This semester -- starting this week -- he’s offering a free weekly office-hour session in a cafe on campus as part of his oneCalculus venture, which also offers free online materials to assist with selected Berkeley math courses. The idea behind Coward’s office hours, documented on oneCalculus’s website , is to help Berkeley math students learn and meet other classmates, even if Coward isn’t being paid to do so. “A lot of my students at Berkeley, when I was officially lecturing there, have now graduated. They told me that the place where they made friends was in my office hours. They weren’t making friends in lecture, because people are shy and there are a lot of students,” he said. But his office hours filled an academic void left by students siphoning off into their various extracurricular clubs and activities. But why would a lecturer return to a university -- especially after suing its system's Board of Regents -- to run a free office-hour session? For Coward, it’s simple. But without his university job, Coward also has to find a way to support himself. Luckily, he said, teaching is a field where it’s possible to do what he loves -- teach without being bogged down by what says is the industry’s unhealthy obsession with grading -- while still earning money. In addition to oneCalculus, Coward is also running EDeeU.com  and EDeeU.education , two closely related sites that allow him to carry on his way of educating. EDeeU.com -- pronounced like the way university websites are often styled, such as Harvard.edu or Berkeley.edu -- is a site that allows students to put together and organize an academic portfolio of what they’ve learned. While learning is the ultimate goal of education, Coward said, EDeeU.com is a platform for students to prove what they’ve learned -- still a necessary burden -- but in a way that doesn’t rely on grade point averages. He drew on the 1997 film Good Will Hunting, where a janitor at the Massachusetts Institute of Technology is recognized for his academic prowess despite not having a formal record of higher education, to illustrate his point. So while education is the primary goal, the portfolio is the means to show off that education, Coward said. EDeeU.com, which launched in May, is free to use, but for the time being only open to Berkeley students. Coward said an expansion of the site to non-Berkeley students is in the works. Coward was offered a contracted, three-week teaching position at Berkeley between July and August, as part of the College of Engineering’s pre-engineering program. The day after the student newspaper published an article announcing his return, however, he said the offer was rescinded. “I would be speculating, but I was very surprised that I got a job offer at all. And when I had got the offer to teach at the engineering department, I assumed that it was because the people who would object to that hadn’t heard about it. And then it ultimately got revoked,” he said. A Berkeley spokeswoman said that the university doesn’t comment on the outcomes of HR processes. The service -- which can take the place of a traditional university, or augment that experience -- brings four things to the table, Coward said. He and Singh advise on curriculum, directing students toward cheap or free online courses geared to what they want to learn and their current level of expertise. Students also receive assistance with courses as problems arise and help putting together a portfolio that shows off what they’ve learned (the project does not grant degrees or certificates but, like EDeeU.com, aims to show the value of learning rather than the value of grades). In addition, students become members of an academic community -- the type of community Coward valued fostering at Berkeley. Coward said he had several hundred students participating in his EDeeU venture, either through EDeeU.com or EDeeU.education -- which launched on Aug. 19 -- although he declined to give an exact number or separate numbers by each website. Berkeley declined to comment on Coward’s apparent continued popularity among -- and interactions with -- its students. Although EDeeU.education is in the early stages, Coward said he’s hoping more lecturers and professors who had similar scuffles with the politics of academe will be interesting in joining him. In the meantime, Berkeley-area students can catch Coward at his office hours.